Add cashews to blender and blend to a powder, then add sea salt, vanilla, and cacao powder and mix again. Add in the medjool dates and raisin and blend, then finally add the coconut oil and blend to a dough. Spoon out and put into a rectangular dish and pop in the freezer for 30 minutes until firm. 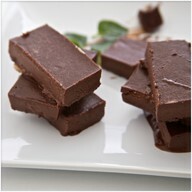 Recipe by nutritional health coach and raw food chef, Sarah Hook.